I found this recipe that I had pulled out of a magazine and didn’t know where it had come from. Thanks to the internet, I found it listed on epicurious.com and bonappetit.com. So, credit where credit is due. This is my version, I made a few changes. 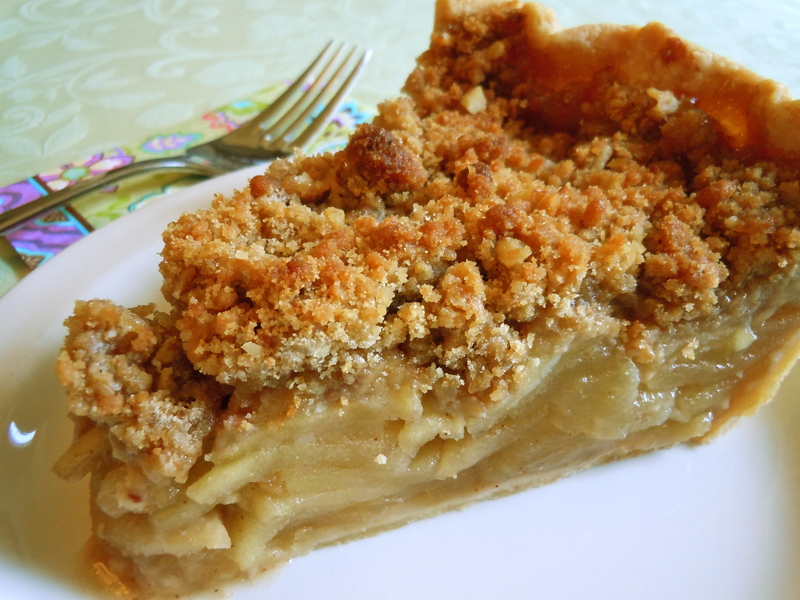 I really love the crunch of the streusel topping and the subtle maple flavor with the apples. Mix together flour, salt and sugar. Cut in shortening. Add ice water 1 Tbl at a time, gently mixing with a fork. Make dough into a disk, wrap in plastic and put in refrigerator for at least 1 hour. Roll out and line a deep dish pie plate. Combine flour, brown sugar, maple syrup, nuts and salt. Cut butter pieces into flour mixture. Transfer 1/4 cup streusel to large bowl to combine with filling. Chill streusel while preparing filling. Position rack in bottom third of oven and preheat to 400°. In large bowl with the 1/4 cup streusel topping, add brown sugar, maple syrup, vanilla, coriander, allspice and salt. Add apples and toss to combine all. Spoon filling into pastry lined pie plate. Dot with 1 Tbl butter. Sprinkle streusel over filling, press lightly. Bake pie until apples are tender and streusel is crisp and golden brown about 1 hour. Cover with foil during baking if starts to get too brown. Let pie stand at least 15 minutes. Serve warm or at room temperature with ice cream.